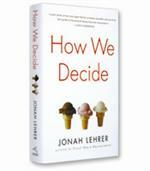 There are seven triggers that compel people to make quick decisions, according to author Russell Granger. They are: friendship, authority, consistency, reciprocity, contrast, reason why, and hope. There is no question that the ability to persuade is an important leadership skill. Granger uses scientific evidence to support the idea that the power of persuasion actually lies in the use of pathos, or emotion. If you’re not a persuasive person, life can be cruel. Just ask Chester Carlson. In 1937, he invented and patented the world’s first photocopy process — not an insignificant development. But he clearly was not a persuasive guy, because he spent the next 22 years trying to sell his idea to dozens of companies, including GE, IBM, RCA and even Kodak. Finally, in 1959 — more than two decades later — the Haloid Company (Xerox’s predecessor) gave Carlson’s idea a shot and introduced the first photocopier. Why couldn’t Carlson convince anyone sooner that the photocopier was a good idea? Since he died in 1968, we may never know for sure, but some experts might say that he probably didn’t make a good argument –– that is, he didn’t properly embrace the three age-old tenets of rhetoric: logos, pathos and ethos. Aristotle famously concluded that the first of these tenets — logos, or logic, which refers to the use of facts and reason — is the most effective method of persuasion. Few have quibbled with Aristotle’s verdict, and even today many experts say that the best way to convince people of anything is to reason with them. In The 7 Triggers to Yes: The New Science Behind Influencing People’s Decisions, author Russell Granger writes that these experts have it all wrong. When it comes to persuasion, Granger explains that using logic is like taking the long way around the block. He points out that modern scientific evidence proves that the power of persuasion actually lies in the use of pathos, or emotion. In The 7 Triggers to Yes, Granger devotes two chapters to heady scientific evidence, which supports the idea that a small portion of the brain called the amygdala influences decision making more than any other mental mechanism. According to modern neuroscience, the amygdala is the body’s emotional navigation system; its job is to receive sensory input and generate a first response — the “gut reaction” that most people rely on for most decisions. New brain research shows that the amygdala generates those “gut” or automatic responses when it receives certain cues or triggers, and it does this much faster than the prefrontal cortex can “make sense of things” and offer a data-based response. This is why persuaders who use amygdala-stimulating techniques — that is, making arguments that are emotionally appealing rather than congested by data and reason — can win people over faster and more easily. Although chapters on goal setting, effective communication and combating resistance are informative, the real usefulness of The 7 Triggers to Yes comes in the chapters devoted to the specific things that stimulate emotional responses: the seven triggers. These triggers are friendship, authority, consistency, reciprocity, contrast, reason why, and hope. Granger explains that these triggers are essentially shortcuts to avoid cognitive evaluation; they compel people to make quick decisions. 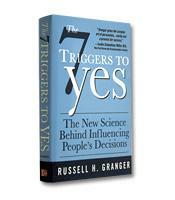 In The 7 Triggers to Yes, each trigger is given its own chapter, explaining how it works and how it can be activated. For example, Granger writes that to activate the contrast trigger — getting the brain to respond to the relativity of stimuli rather than the objective values of stimuli — one should present the most expensive, time-consuming, complicated or otherwise unfavorable option first. That way, the presenter’s proposal will seem more beneficial than it would appear without the comparison.